Old Man Winter has shook his snowy beard in Colorado, leaving frigid, dangerous conditions for dogs. Already, police have been called in Denver when a dog was seen outside, covered in snow. If you see a dog outdoors in distress, please call the police immediately with a description of the dog and address. A digital picture also helps. If it is below freezing, use extreme caution when your dog is outdoors. Make sure your dog is sporting protective gear, such as paw-boots and dog jackets. Limit your time outdoors with your dog to 5-15 minutes, or to your dog’s tolerance. Be sensitive to your dog’s age and thickness of their natural coat. Avoid salted areas – the highly heated chemical can burn or severely injure your dog if they lick the salt from their coats or paws. 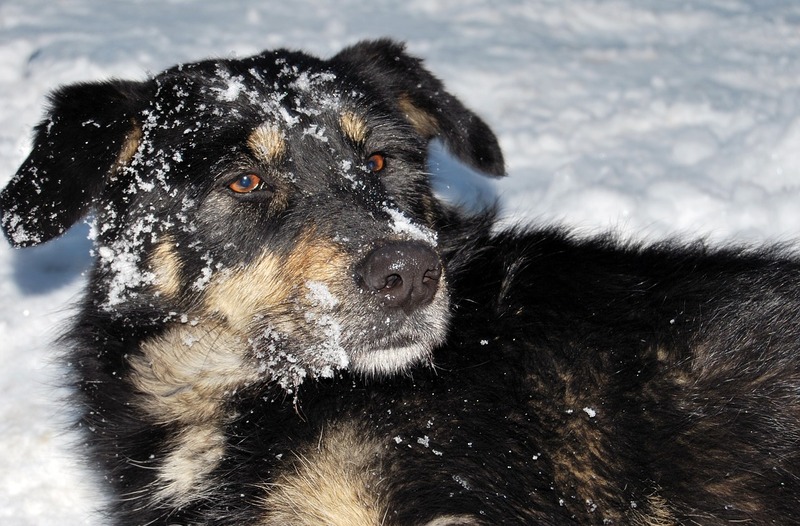 For larger dog breeds with thick coats, use Musher’s Wax to avoid snow-balling in paws. Do not leave your dog unattended in dog runs or fenced yards! One distraction can cause you to forget your dog and imperil their safety! Set a timer for 5 minutes, or better yet, go out with them. Shovel paths throughout your yard and along the fence line for smaller dogs. Snow deeper than a dog’s dew claw can kick up to their stomach when running and drop their body temperature more quickly. If you have to use outdoor kennels, do what needs must, but if you can bring your dog inside your house during frigid weather, all the better! Should you have any concerns or questions regarding your particular dog, please contact your vet. We walk dogs in the wintertime! We’re frequently asked if our dog walking service continues throughout the winter months – they answer is yes! Contact us today to learn how your dogs could benefit from getting out for a walk mid-day! Our loving, experienced dog walking team is here to help!